It's not for the faint of wallet, but the Axe-Fx II delivers supreme modelling power in a hardy piece of kit. Doubled processing power delivers amazing performance. The Axe-Fx II offers more than 70 high-quality emulations to play with. The updated Axe-Fx thankfully includes the USB port that was missing from the original. With a list of users that includes Steve Vai, John Petrucci, Jeff Loomis and Periphery's Misha Mansoor, Fractal's amp and fx-loaded guitar preamp is one of the most talked up pieces of equipment in recent years. For the new Axe-Fx II, Fractal has doubled the processing power and improved amp and speaker simulation. The front panel's had an overhaul too, with a larger screen, a quartet of Quick Control knobs for real-time editing and an X/Y switching mode that enables you to flick between two different settings of the same model without changing patches. "The Axe-Fx II is loaded with all the usual effects groups, but the delay sounds really caught our attention." Connection-wise, Fractal has added a USB interface for both audio and editing, as well as a dedicated port for the MFC-101 foot controller. 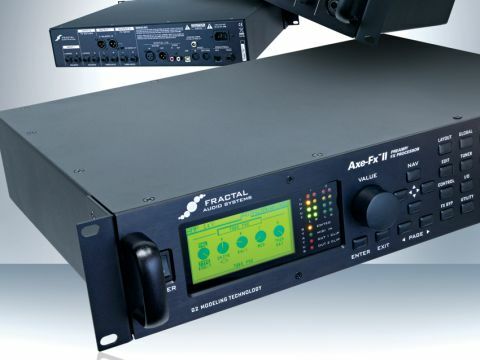 In short, the Axe-Fx II does more and, according to Fractal, does it better. Just listing the Axe-Fx's models would fill this space, but we can explain some of the basic concepts. Your set-up for each patch is centred on a 4x12 grid of empty 'blocks'. Amp or effect modules are then added to the blocks to build your rig. The signal is connected from the input to output stages with virtual cables and a 'shunt' is used to pass it through empty blocks. Sound tricky? It's actually quite easy once you get going, and the new Quick Control knobs certainly help. You could create 'standard' set-ups such as a couple of pedals with an amp and cab and be done with it, but the unit also allows an entirely non-linear approach to splitting and merging your signal across complex multi-amp and effects rigs. Fractal is wary of badging the Axe-Fx II as just a modeller. While it admits to spending years and a ton of cash emulating classic bits of kit - and the amp models are some of the finest to grace our lugs - Fractal is also trying to offer flexibility. This is continued with the 70 speaker cab emulations; everything from a 1x6-inch oval Supro speaker to 2x12, 4x10 and 4x12 cabs is on offer. You can create impulses of your own and store up to 50 inside the unit. Each cabinet can then be mic'd by one of 10 virtual iconic dynamic or condenser microphones. The Axe-Fx II is also loaded with all the usual effects groups - drives, mods, pitch-based effects, filters and so on - but the delay sounds really caught our attention. The conventional slapback, ping-pong and tempo-sync'd delays are all in there, but where it really scores is with its long, evaporating, crystalline delays. Pick the right part and your guitar can conjure huge, sublime soundscapes. That's all well and good, but you might have seen the price. It's a serious chunk of change, especially when products such as the Line 6 POD HD offer so much for a hell of a lot less. We should also mention that Peavey's ReValver MK III.V plug-in has similar component-level editing options, while Native Instruments' Guitar Rig 5 provides a range of modifiers comparable to the Axe-Fx's. But the Axe-Fx II delivers all this and more in a solid, road-ready piece of hardware. It demands time and attention, but the reward comes with the sound and feel of using the real thing. If you've got a wallet full of cash, a snout for tone and some patience, you'll want the Axe-Fx II.